Product #21013 | SKU SASP100 | 0.0 (no ratings yet) Thanks for your rating! 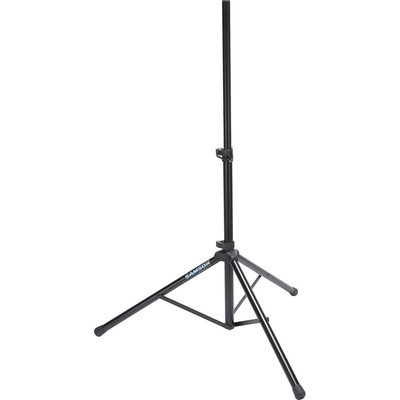 The SP100 Speaker Stand from Samson is a lightweight, telescoping tripod speaker stand. The SP100 features a roadworthy, aluminum-constructed design with a black finish. With a standard 1 3/8" pole adapter, the SP100 fits any PA speaker. Adjustable up to 6' in height, this stand can handle enclosures that weigh up to 110lb and has a locking latch for increased support.